After dates at The Queen’s Hall, Edinburgh and Wellington Church, Glasgow the Scottish Ensemble’s Prophecy tour moved on to King’s Place, the stunning new arts and conference centre that features music, the spoken word, comedy and visual arts. I love the building’s clean modernist lines and the intimate chamber acoustic of shoebox-shaped Hall 1 with its stunning oak interior where I have been invited to review. Founded in 1969, the Glasgow based Scottish Ensemble is the UK’s leading professional string orchestra. With a core of 12 performers, their innovative approach to programming juxtaposes music from different eras and styles to create new and unexpected creative connections between composers and genres.Their first tour of 2018 is entitled Prophecy and promises a journey through some of the mythologies of Ancient Greece with tales of Apollo, Dido and Ariadne explored through the intriguing combination of music from Berlioz, Purcell, Haydn and Stravinsky. For this series of concerts, the Scottish Ensemble was joined by violinist Matthew Truscott as guest leader. Matthew is also leader of the Mahler Chamber Orchestra and one of the leaders of Orchestra of the Age of Enlightenment. He struck a self-deprecating air on stage, introducing the works with a wry diffidence that belied his understanding of the works and the restrained passion of his playing. The concert opened with the first half of Stravinsky’s ‘Apollon musagète’ (1927–28) originally conceived as a ‘ballet blanc’ (to be staged in white) for the Ballet Russes with choreography by George Balanchine, the ‘Prologue: The Birth of Apollo’ had the stately dotted feel of a French Baroque overture. With some strong ensemble playing and a keen sense of dynamic and tone, the contrapuntal lines were carefully traced through as the piece developed. The second half concluded with Haydn’s 1789 solo Italian cantata ‘Arianna a Naxos’ in which the Scottish Ensemble was joined onstage by Scottish mezzo-soprano Karen Cargill, winner of the 2002 Kathleen Ferrier Award. Cargill owned the stage building the emotion in a carefully nuanced performance. There were some audibility issues on a couple of occasions with the ensemble not quite matching Cargill’s dynamic range but otherwise, this was a fine account of the piece. The Scottish Ensemble came into their own with a plangent rendition of Purcell’s ‘Overture to Dido and Aeneas’ (1689). The tension and release of the suspensions that define the composition were beautifully handled and the rhythmic connection with the Stravinsky was a revelation. After the restraint of the Purcell, Berlioz’s ‘Ah! Ah! Je vais mourir! … Adieu, fière cité’ (Dido’s aria) from Les Troyens was a moment of high operatic drama with this small group of musicians ably supporting Karen Cargill’s impassioned reading. To help us calm down we returned to the gorgeous chromaticism of Purcell and his Fantasia no.7 which set the scene for Dido’s second demise of the night. The popularity of ‘When I am laid in earth’ (Dido’s Lament) from Purcell’s Dido and Aeneas makes it one of those pieces that is problematic to perform – its overexposure diminishes the visceral impact of the music. I found Karen Cargill’s voice too rich and powerful for Purcell’s austere journey – maybe the Berlioz should have been placed later in the programme to allow for a more straightforward dramatic journey? The three final sections of Stravinsky’s ‘Apollon musagète’ concluded the main body of the performance. The ‘Pas de deux’ mixed lush Hollywood orchestration with a soaring romantic melody; the performance of the ‘Coda’ had a jaunty muscularity and the ‘Apotheosis’ shimmered with Apollonian virtue and reason. 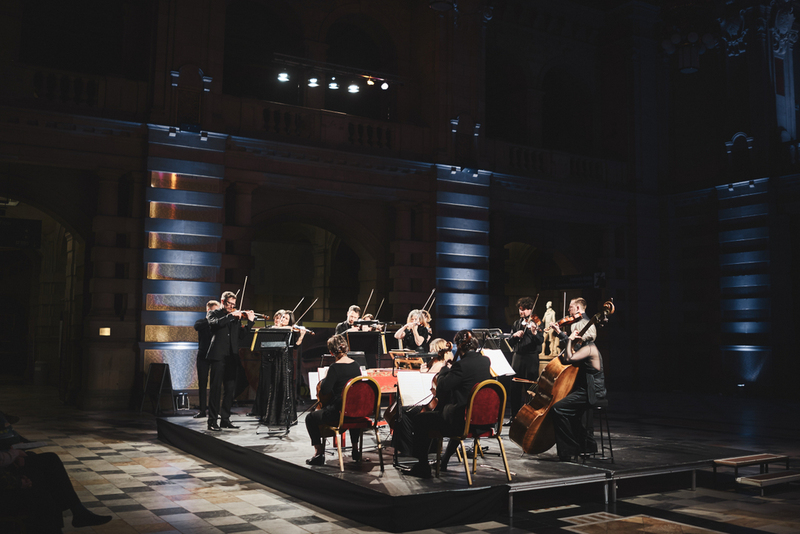 After a swaggering encore of the ‘Curtain Tune’ from Purcell’s ‘Timon of Athens’ the audience wandered out into a chilly King’s Cross evening having been enthralled by a fine evening of music making in a fabulous space. It was a perfect way to end the week.